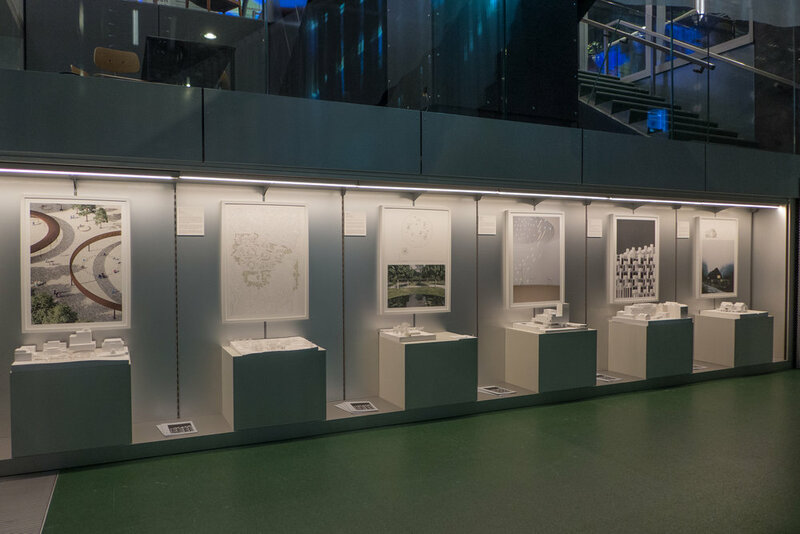 The exhibition is tightly or even formally arranged with projects by POINT shown with a single image and below, set on a cube, a 3D printed model. These models emphasise the mass or form of the buildings but also show the topography of the site - printed as thin layers from map contours so giving the models a slightly detached feel that is curiously remote from anything organic like rock or mud. Perhaps, the main problem is that this way of presenting the buildings removes any clear idea of materials or surface texture or even colour on the buildings. Although external form is easy to appreciate, for most projects there is little idea of the plan of these buildings or function or organisation and sequence or an impression of the experience of moving through the internal space. Several of the projects, particularly those for buildings or monuments in gardens, including a proposal for a raised pond at Mindelunden, the war memorial in Hellerup, have a stunning and elegant simplicity and a design for Hellerenhus, a museum site in a gorge at Jøssing fjord in Norway, is both appropriately simple but starkly dramatic.